If you want to contribute to the parallel sessions of the workshop, please submit your abstracts to the conveners of the respective working groups. a welcome reception will take place at DESY in the evening of Monday, May 27.
the workshop banquet dinner will take place in the evening of Wednesday, May 29, at the Schulauer Fährhaus, directly at the river Elbe. Prof. Klaus Desch (University of Bonn) will give a public lecture in the evening of Tuesday, May 28th, in the main building of Hamburg University (downtown Hamburg). The talk is envisaged for the open public, all workshop participants are invited to join. 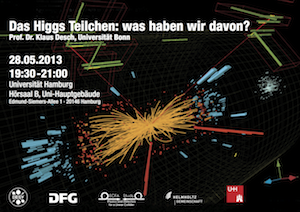 The talk will be given in German, title: "Das Higgs-Teilchen: Was haben wir davon?" On Thursday, May 30th, the DESY Accelerator Show "Rennmaschinen" will give a special feature in the DESY auditorium at 18:00. As this event targets especially high school students from the Hamburg area, the main language will also be German.